While we were in Glasgow last week we went to have a look at the exhibition Colour, Rhythm and Form: J. D. Fergusson and France showing at the Hunterian Art Gallery until 8 January 2012. 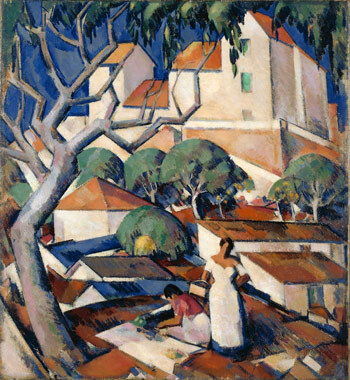 It features a large number of paintings from the Fergusson Gallery in Perth together with works from the Hunterian’s own collection and three painting loaned by the Pompidou centre in Paris. Fergusson (1874-1961) was one of the group of four Scottish artists collectively known as “the Scottish Colourists”, the others being Samuel John Peploe (1871-1935), George Leslie Hunter (1877-1931) and Francis Campbell Boileau Cadell (1883-1937). They were all strongly influenced by French Avant-garde art from the early Twentieth Century, putting their own Scottish stamp on the styles. 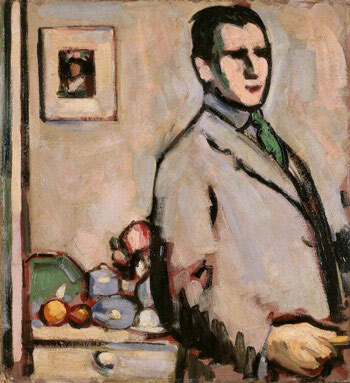 Fergusson, Peploe and Hunter exhibited together in Paris as Les Peintres de l’Écosse Moderne (Modern Scottish Painters) in 1924 and Les Peintres Ecossais (The Scottish Painters) in 1931. 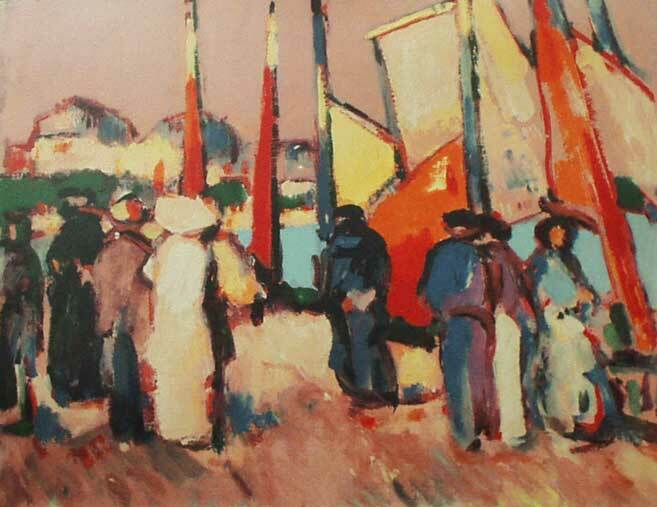 As the title of the exhibition suggests, it focuses on Fergusson’s work but there are some examples of paintings by other Colourists. He lived in France between 1907 and 1914 and returned a number of times after the war. I’d first come across his work in Manchester City Art Gallery who have one of his paintings in their collection. As I noted in a previous post, I liked the simplicity of the composition and the style of painting – broad brush strokes and bright colours. This picture wasn’t included in the Hunterian exhibition, but there were plenty of other works to see that illustrated how Fergusson and the other “Colourists” were heavily influenced by the exciting developments in art taking place in Paris at the turn of the 20th Century. 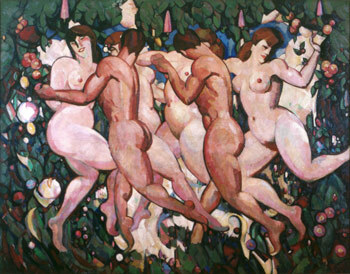 I’d recently seen the exhibition in Budapest of works by the “Hungarian Fauvists (A Nyolcak)” , another group of artists who were in Paris around the same time and were also heavily influenced by Cubist and Fauvist ideas, so it was particularly interesting to see how Fergusson’s work compared. 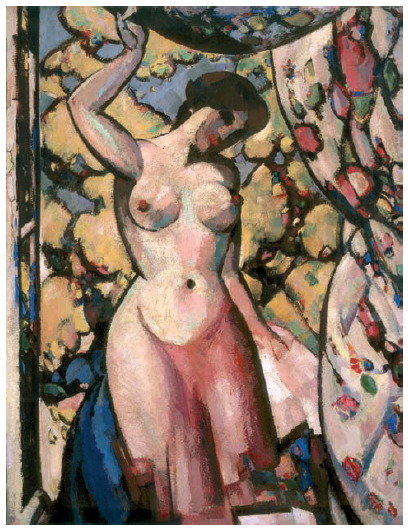 The works were displayed chronologically so it was easy to see how Fergusson’s style developed and changed over time as he absorbed influences from French artistic movements. — J. D. Fergusson, Modern Scottish Painting, William MacLellan, Glasgow 1943. 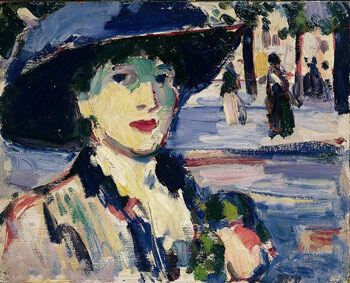 Many of Fergusson’s paintings displayed in the exhibition are of women. The American artist Anne Estelle Rice, who he met in Paris, and his long term partner, who he met in France in 1913, the dancer Margaret Morris, both modelled for him and feature in many of his works. That’s Anne in the Chinese outfit above and in the next couple of pictures. 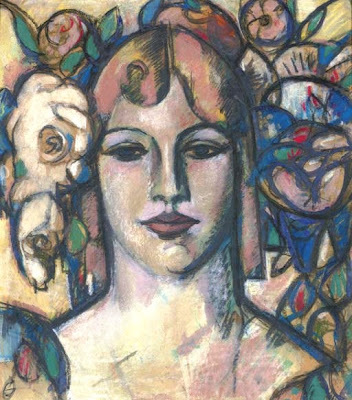 Margaret features heavily in his work from 1913 onwards. The painting from the Manchester City Art Gallery, which was painted in 1906, the year before he moved to France, shows a strong Impressionist influence. The earlier paintings from his time in Paris, such as Anne Estelle Rice in Paris, continue this trend. J. D. Fergusson, Anne Estelle Rice in Paris, Closerie des Lilas, 1907 © The Fergusson Gallery, Perth and Kinross Council. But he was soon trying out new styles as can be seen in Le Voile Persan , a very “flat” painting where the blocks of colour are outlined with heavy lines and less naturalistic colours are beginning to creep in. This was my favourite of all the pictures in the exhibition. It’s from the Hunterian Gallery’s own collection and I’d seen it during a previous visit in July. I was so taken with it I’d even bought a postcard! Another picture I liked was this portrait of Margaret Morris. One of his paintings, La Déssee de la Rivière was purchased by the French Government on the opening day of the 1931 exhibition held in Paris. It’s now held by the Pompidou Centre who have lent it to the Hunterian, together with two other paintings, La Forêt by Peploe and Lac Lomond by Hunter, which they purchased at the same time. 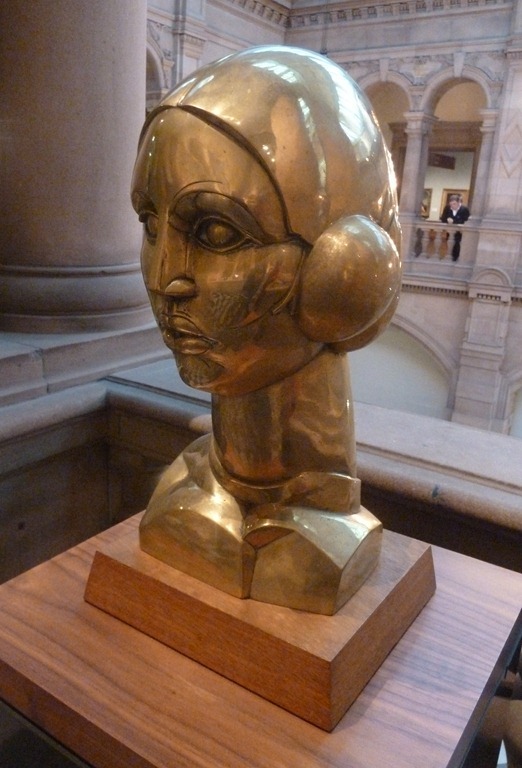 There were a couple of sculptures displayed, including a cast of Estre, Hymn to the Sun – a bust of Margaret Morris. We’d seen another copy a little earlier in the day when we’d visited the Kelvingrove Museum, who have a small collection of works by the Colourists. I thought that this was an excellent exhibition, providing a good opportunity to learn more about an important Scottish artist. Talking to one of the staff, attendance so far has been on the low side. She reckoned it was because Scots aren’t used to paying to see exhibitions (entry cost £5 each). I can understand that. Charging a fee inevitably restricts entry to the more affluent. However, the exhibition deserves to be a success. It’s on until 8 January and is definitely worth a visit by anyone interested in 20th Century British art. This entry was posted in Art and tagged Art, exhibition, Glasgow, Hunterian Gallery, J. D. Fergusson, John Fergusson, Scottish Colourists by ms6282. Bookmark the permalink. Ah, I see you’ve made it out to our neck of the woods! This is long before I had “met” you so I didn’t realise you knew Glasgow already. We went to this exhibition too, though I don’t remember it being particularly quiet. Special exhibitions at both Kelvingrove and the Hunterian are usually a few pounds to get into, but I think more people know about Kelvingrove and the university setting maybe “hides” the Hunterian. When we were in Toronto we thought it very expensive to get into their State museums and galleries because we are used to the main collections being free. I’ve visited Glasgow a few times over the past 10 years. Usually just a flying visit or for a conference like this time. Although we did a couple of day visits about 5 years ago when we got some bargain rail tickets using Teco Clubcard points. It’s less than 3 hours to Glasgow from Wigan (when there’s no engineering works!) so we took an early train and left about 6 o’clock. A longish day but doable. We keep meaning to do that again some time as we have quite a few points that need spending!